While the tickets have all sold out in the short period of time between announcement and our posting of this news item, Ayreon will perform live for the first time ever as Ayreon Universe, performing the best of Ayreon (presumably new material as well, as there is a new album being recorded; more on that below). The now sold-out dates are: September 15, 16 and 17, 2017 at the Poppodium 013 in Tilburg, NL. Haken celebrate their 10th anniversary in 2017, hot on the heels of the release of their critically acclaimed fourth album Affinity. Coinciding with this, the band will go out on a headline tour of Europe in March & April. Tickets went on sale November 23. InsideOutMusic will also be reissuing the band’s first two albums, Aquarius & Visions, on the 3rd February 2017 in new remastered 2CD editions, as well as vinyl for the very first time. As reported earlier this week via Prog and Glass Hammer themselves: "US proggers Glass Hammer will perform their first ever European live show when they headline Italy's 2 Days Of Prog + 1 Festival in September 2017. If you recall, some years ago there was a band called Rhapsody. They changed their name to Rhapsody Of Fire in 2003 due to some sort of name-conflict with the Rhapsody music service. Then the band split in 2011 ... but in the unusual way of splitting into two, not just all going their separate ways. Rhapsody Of Fire continued with some members, Luca Turilli's Rhapsody with others (noticeably, of course, Luca Turilli, Rhapsody's/ROF's main composer). That's the rather spotty "Cliff Notes" version of the "story so far." Each thread has released music since the cleaving -- ROF with Dark Wings Of Steel (2013) and Into The Legend (2015); LTR with Ascending To Infinity (2012) and Prometheus, Symphonia Ignis Divinus (2015) (a reissue called Prometheus, The Dolby Atmos Experience + Cinematic And Live is due on December 9, marking the first studio album remixed in Dolby Atmos - we'll talk about that later). As shared by Intromental on November 23: "Having 3 bands like Wolverine, Until Rain and Lost In Thought, teaming up for a European tour, you're in for a prog-show, in the true meaning of covering the full spectrum of the genre. Be it Wolverine's ambient and tranquil approach, Until Rain's more bombastic but also darker type of prog to the Dream Theater-ish technical angle of Lost In Thought, it's all there. A night, you won't want to miss, no matter which sub-genre, you prefer. "Wolverine recently released their 5th album, and have received great reviews from the press and fantastic feedback from the fans. The band has evolved from being a death metal act in the early days, to an ambient and melodic kind of progressive band. It's definitely in the softer area of the metal genre, but the emotion, the band creates, has an extremely high impact, when the ideas settle in the minds of the listener. As posted at Prog magazine's website - and shared by Marillion - "Marillion have been announced as the Friday night headliner at this [coming] year's Be Prog! My Friend festival in Barcelona. "The UK prog rockers, currently riding high in the charts with new album FEAR, the band's highest charting UK album since 1987's Clutching At Straws will perform on Friday June 30. They join fellow headliners Jethro Tull, who perform on Saturday July 1 and Ulver, Anathema, Animals As Leaders and Caligula's Horse who have previously been announced. In more touring news, Jethro Tull have announced a series of Fall tour dates where they will hit the West Coast of the US (dates below). Tull will also tour Germany (with one Switzerland date) in November and Ian Anderson will play some Christmas shows in December, then Tull are back in Europe in February 2017 for a few dates (these dates also listed below). Joining Ian Anderson to perform the works of Jethro Tull are* Florian Opahle (guitar), David Goodier (basses), John O'Hara (orchestral conductor, piano, keyboards, accordion), Scott Hammond (drums, percussion), Ryan O'Donnell (vocals and stage antics), Unnur Birna Björnsdóttir (vocals, violin) and Greig Robinson (bass). Yes announced a 6 date Japanese Tour for November 2016 today, where they will be playing Yessongs and Tales From Topographic Oceans sides 1&4. 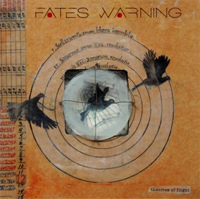 U.S. Progressive Metal pioneers Fates Warning have confirmed their first touring run in Europe for their much acclaimed new album Theories Of Flight. The tour will be taking place in January/February 2017 and will feature Armored Dawn in the opening slot and one further band to be announced soon. See dates below. Fates Warning vocalist Ray Alder checked in with the following comment: "Hello all! We are happy to finally announce the tour dates for the first leg of our world tour for Theories Of Flight! We are very excited and cannot wait to hit the road with the new album! There will be more dates announced soon, as well as a few surprises, so keep an eye out... We look forward to seeing you all on this next tour! See you soon!" · Steve Howe To Tour UK In Support of "Homebrew 6"
· Symphony X Release Details About The Only U.S./Canadian Shows Of 2016!